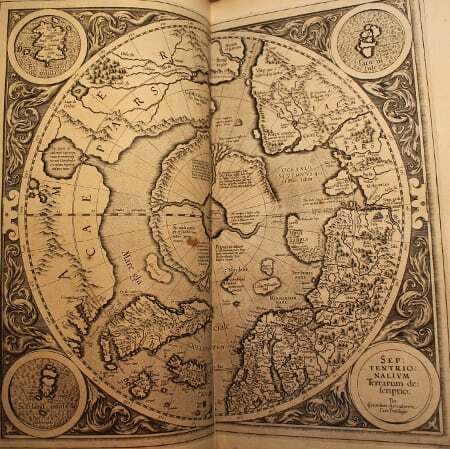 Mercator was a founder of the Flemish school of cartography and was one of the most famous geographers in his day. His knowledge was not gleaned from travelling, but rather from his vast library of books and maps, and from correspondence with other scholars, travellers, merchants and seamen. He was the first person to use the word ‘atlas’ in a geographical context as the title for the collection of bound maps that he published in 1589. Following his death in 1594, Mercator’s family endeavoured to continue his work by publishing a number of different editions of the Atlas. However, these did not enjoy much commercial success and in 1604 the copper plates for maps were sold to Jodocus Hondius, another Flemish cartographer. He published a revised edition of the Atlas in 1606, with almost 40 additional maps. A volume of this edition is held in the Chapter Library and pictured here [SGC RBK M.179]. The majority of the maps in the Atlas are remarkably accurate. The shape and size of many continents and countries are well established. However, as this map of the Arctic Circle shows, much remained unknown. This map depicts a few interesting geographical features that you would not find in a modern atlas. At the centre is the Rupes Nigra, or Black Rock, which lies at the North Pole. The Rupes Nigra was believed to be a huge magnetic rock, 180km in diameter, which explained why compasses pointed north. The origin of this belief was a fourteenth century Franciscan friar who claimed to have explored the North Atlantic. The fact that he also claimed that any vessel which got too close the North Pole would be drawn into an abyss indicates that the concept of the Rupes Nigra was very much a feat of imagination! Another case of imaginative wishful thinking is the Strait of Anian, a sea passage separating Asia from North America, located at the very top of the map. Trade between the Chinese Empire and Europe flourished during the Early Modern period, and it was thought that the discovery of a trade route through the Arctic Sea would bring enormous riches. The Strait of Anian first appeared on a 1562 map. It continued to be depicted on maps right up until the 18th century, when explorer Samuel Hearne made a 3600 mile land journey to find the Strait, and came back confirming that it definitely did not exist. Finally, slotted in between Greenland and the Arctic Circle is an island called Groclanct. The appearance of this mysterious island may be due to a number of factors. 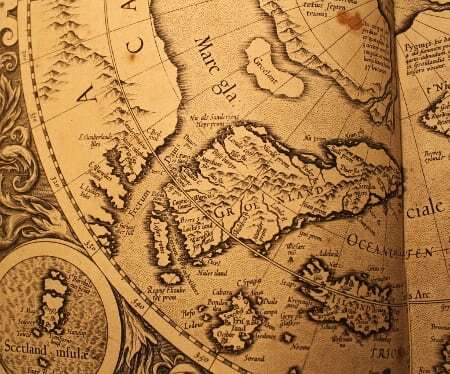 The earliest maps to show Greenland depict it as being attached to the European mainland, and its position on maps evolves throughout the fifteenth century until two separate islands, Greenland and Groclanct begin to appear. It is possible that misspellings of Groenland (as Greenland was first called) also compounded the belief that two islands existed, rather than just one. Close inspection of the map reveals many more inconsistencies with what we know of the world today. Nevertheless, if you put a modern map alongside Mercator’s version, there are also a great number of similarities. This bares testimony to the talents of the cartographer, and to the persistence and accuracy of the explorers who ventured into unknown waters far from home in search of something new. Acknowledgement: The Phantom Atlas (2016) by Edward Brooke-Hitching provided much of the information in this article.